We're spending our final night in our little bungalow. It's so comfortable and welcoming, yet we're both SO ready to be aboard Wings. It's the end of two weeks of work in very hot weather. We're ready to start having some fun. 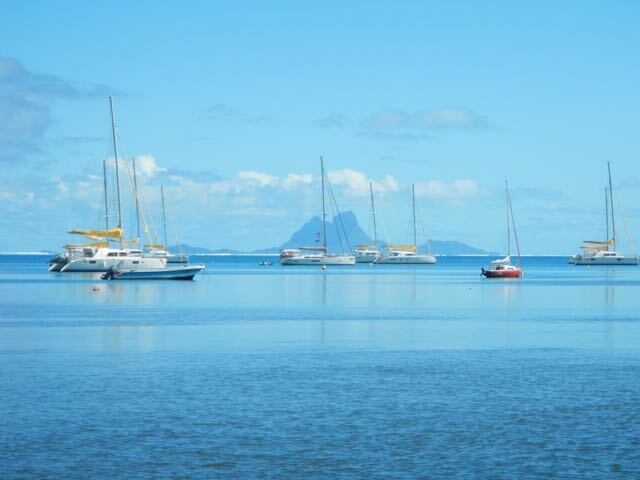 As we drive to the yard each morning, we see this scene as we pass by Marina Apooiti: the Moorings and SunSail catamarans moored in the foreground, and Bora Bora rising out of the sea behind. Damn big volcano for being 60 miles away. 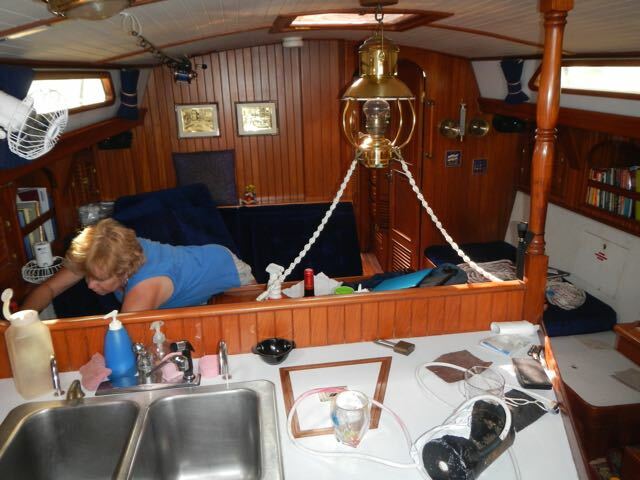 Conni scrubbing the woodwork below decks. If you recall the photograph of our first visit to the boat, you can imagine the effort that she's exerted to remake our home. 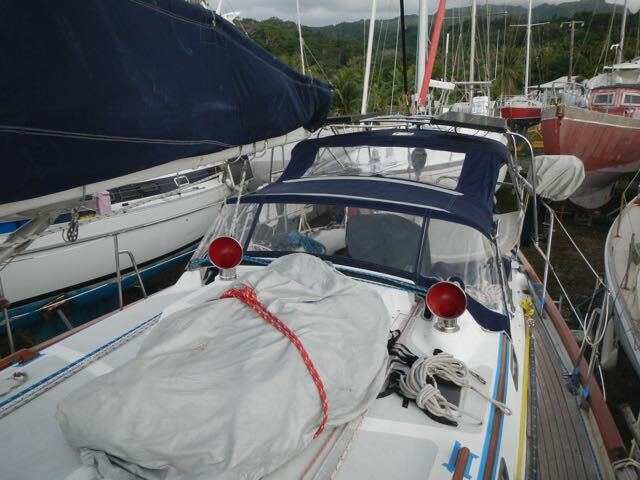 This is the aft berth, used as a "garage" when we have no guests aboard. 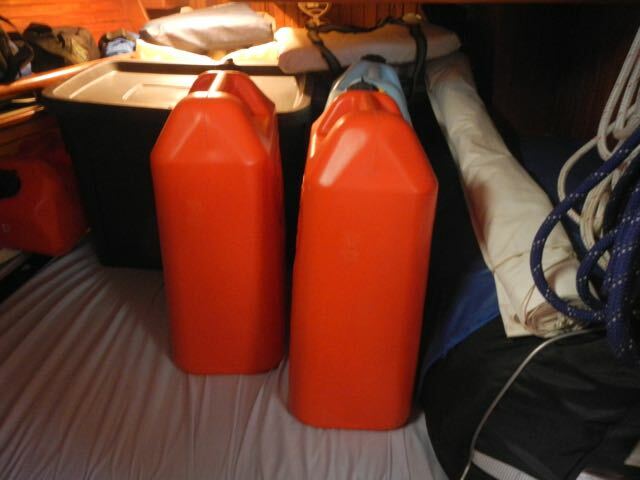 The bulky cylinder at right is our life raft, and our ever-present blue boxes are stowed along the berth. This boat is from Vermont. 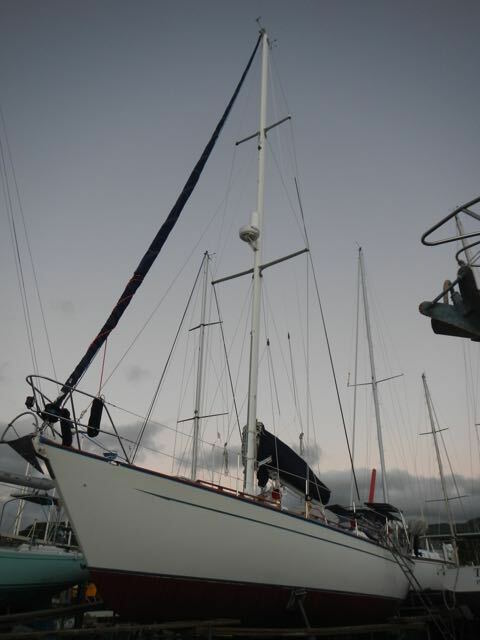 She's a Hallberg-Rassey, a well-respected cruising boat and our new friends, Bill and Laura and daughter Isabelle, sailed her all the way here. 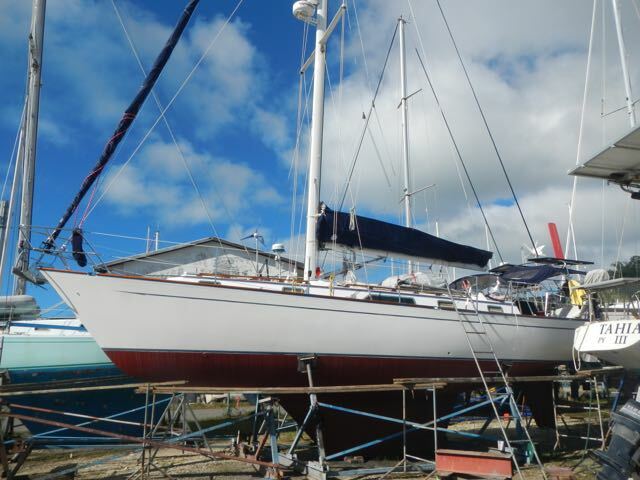 Wings as she appeared today, with both sails up, Hydrovane prepared, bottom painted, and varnish applied to cap rails. Ain't she beautiful? 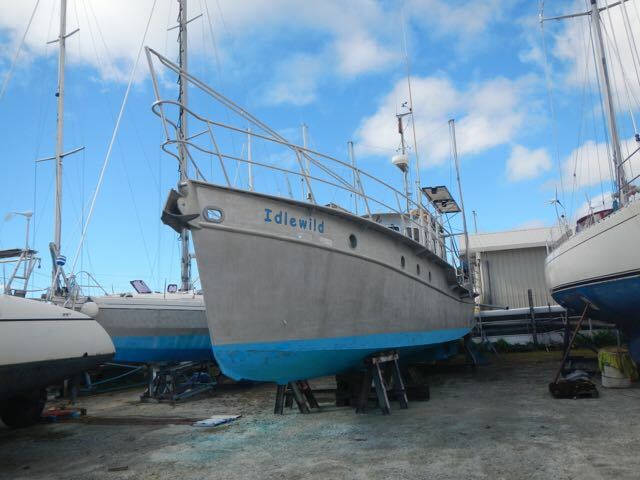 This is Idlewild, a Canadian boat with an interesting history. She is a 57-foot aluminum boat that's the most economical one that I know. Do check this story. She has the record for the longest non-stop passage by a recreational craft: 4500 miles in 30 days, using 1.39 gallons of fuel per hour. Impressive. 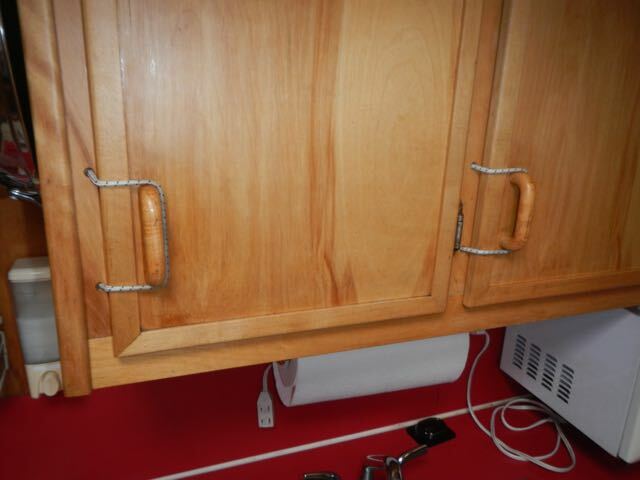 This is the way that Idlewild's designer chose to keep cabinets closed. It's indicative of the entire design: clever and efficient. 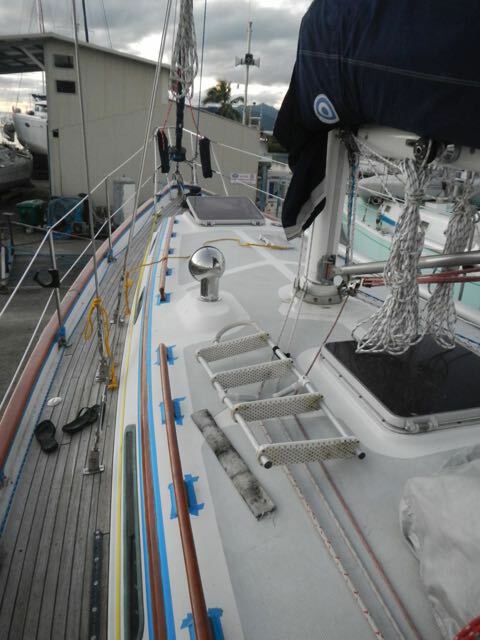 Our foredeck shows the blue tape used to mask for the varnishing, but we also have a clean foredeck! 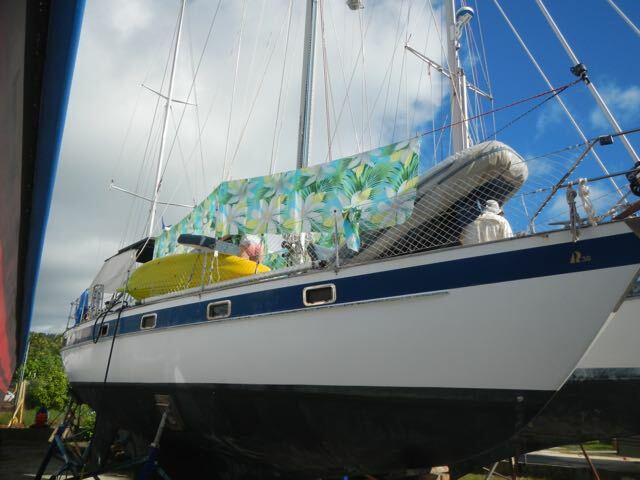 Sails are up, sheet bags are installed: we're ready! The large red-roped package here is the dinghy, but as you can see, the bimini and dodger are all installed. The year-old Mercury 5HP outboard is shrouded in the gray cover at right. Wings from the ground, showing the radome that I repaired and all of the other accoutrements that we've installed these past two weeks. Back at our bungalow, Conni prepared, as she does every night, a feast of appetizers. We have saucisse, baguette, good cheese, and, in this case, an excellent rum and Coke. Lovely! 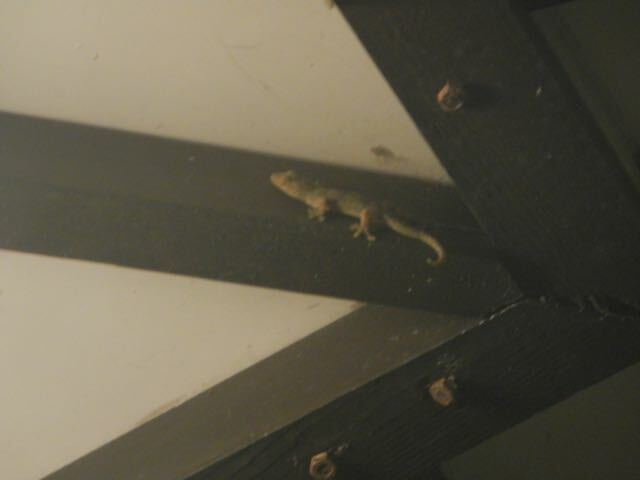 This lizard is on the underside of our patio ceiling. Why? Remember the response given by the bank robber when asked why he robbed banks? That's where the money is! Well, in this case, the patio light is just in front of the lizard, and he and a buddy are dining on the insects.